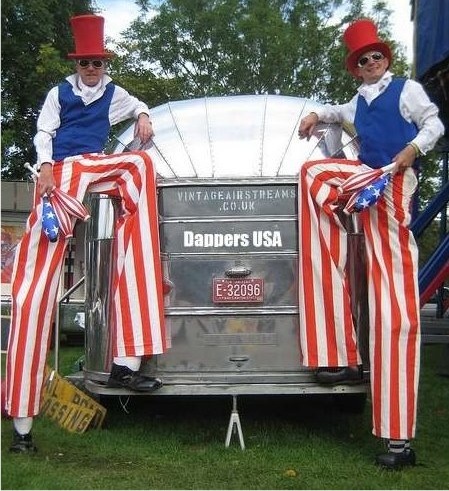 Maynard’s Chaps speciality is fully developed walkabout and stilt walking characters of the highest calibre. 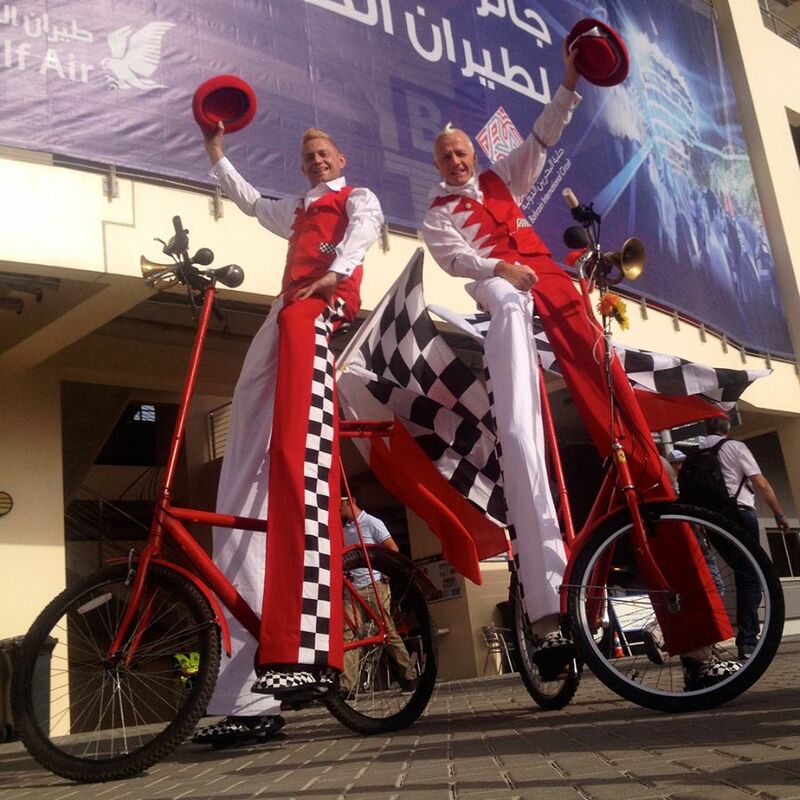 They mix interaction and improvisation with prepared material to add to the atmosphere at any event. 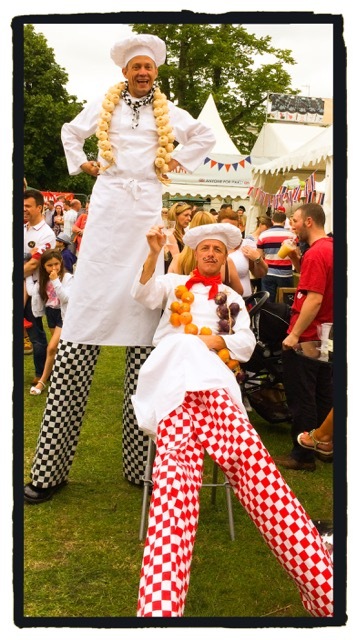 Subtle or gregarious, their varied experience means you can relax and let them get on with entertaining your guests! 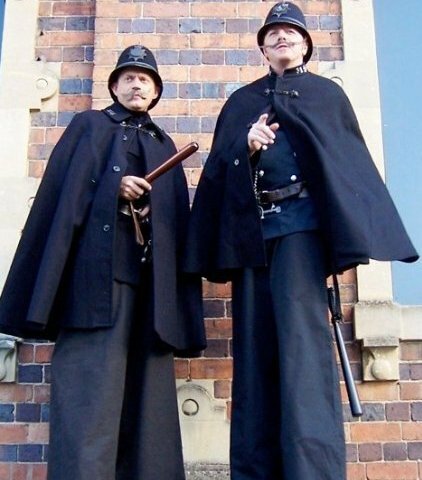 The Chipper Coppers are a pair of jovial Victorian policemen ensuring the high standards of the good old days are maintained at any event. 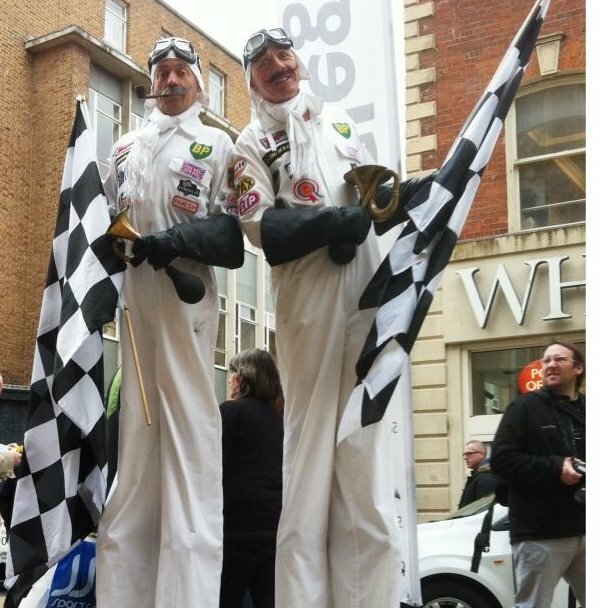 Whether on stilts or perambulating on their penny farthings they will bring smiles and mirth to even the most hardened criminals. Tally ho old chap! Chin chin and pip pip! Monty and Carruthers are hot blooded and fearless racing gentlemen who speed out of the 1920’s bringing the spirit of the golden age of racing to you. Authentic outfits and lively comedy banter will amuse passers by. 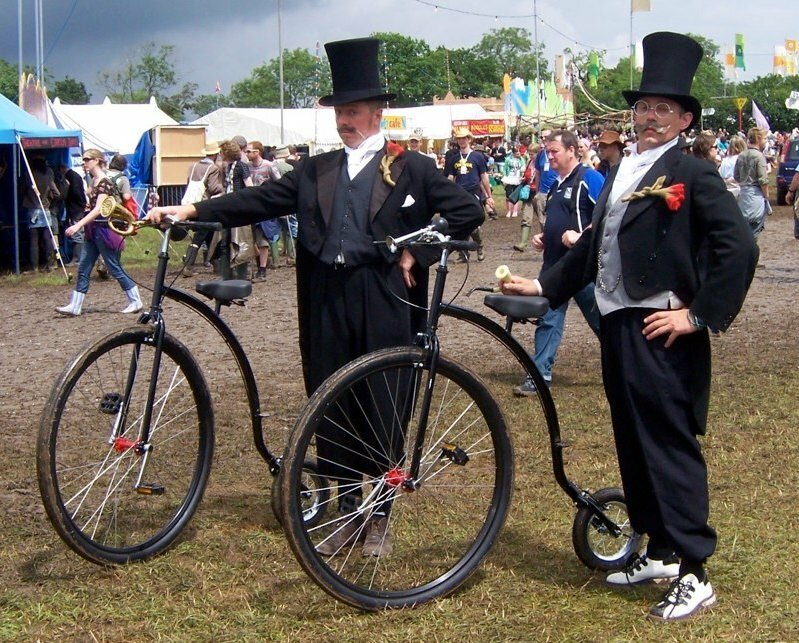 Reginald ‘Tic Toc Monty’ Montgomery Carruthers the Fourth and Quentin ‘Bang On’ Bladderhasit Carruthers the Third – are true gentlemen, impeccably turned out in their Victorian attire and perambulating on their penny farthings. A most meritorious sight! 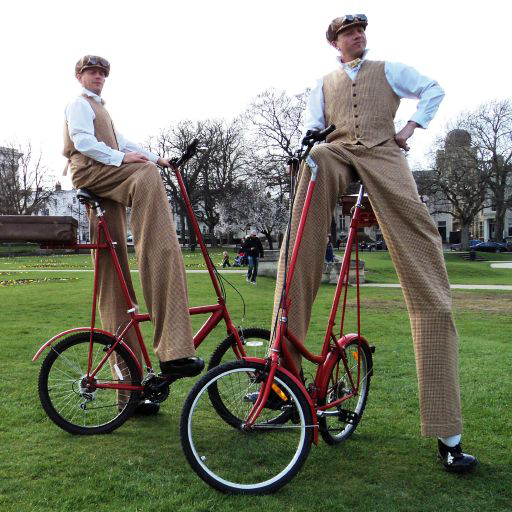 The Dapper Chaps don their casual attire for a brisk perambulation on their trusty bicycles. With their caps and goggles they make a fine and meritorious site that will raise the tone of any event. Genteel, sophisticated and just a little bit posh they are very keen to chat about the joys of cycling and the merits of fresh air! 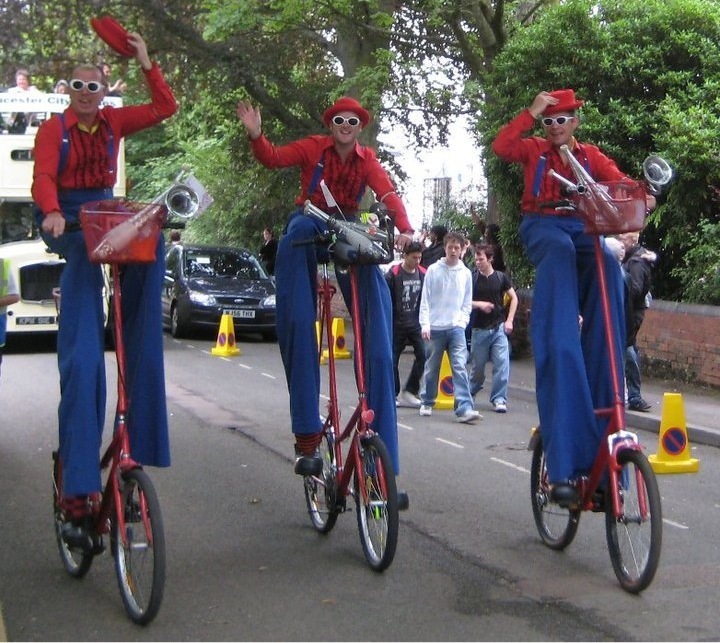 Their stiltbikes are specially converted mountain bikes with extended handlebars and seat posts so they can ride them on stilts. They are very visible, most unusual and very eyecatching. They can cover a lot of area during a walkabout (ride-about) session. 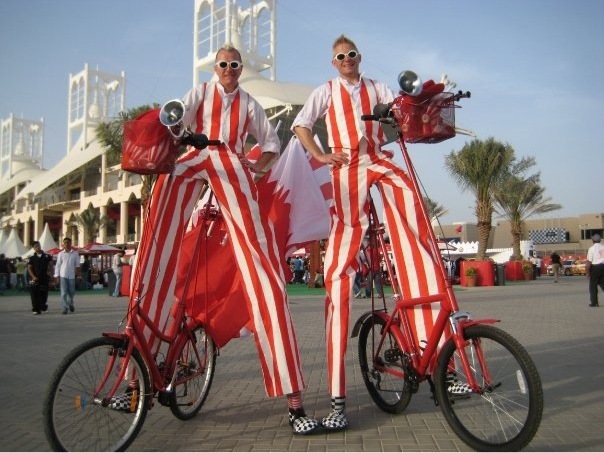 We have numerous costumes and three bikes and can theme the bikes for any event with flags and props. Oui Oui. Un oeuf is enough! 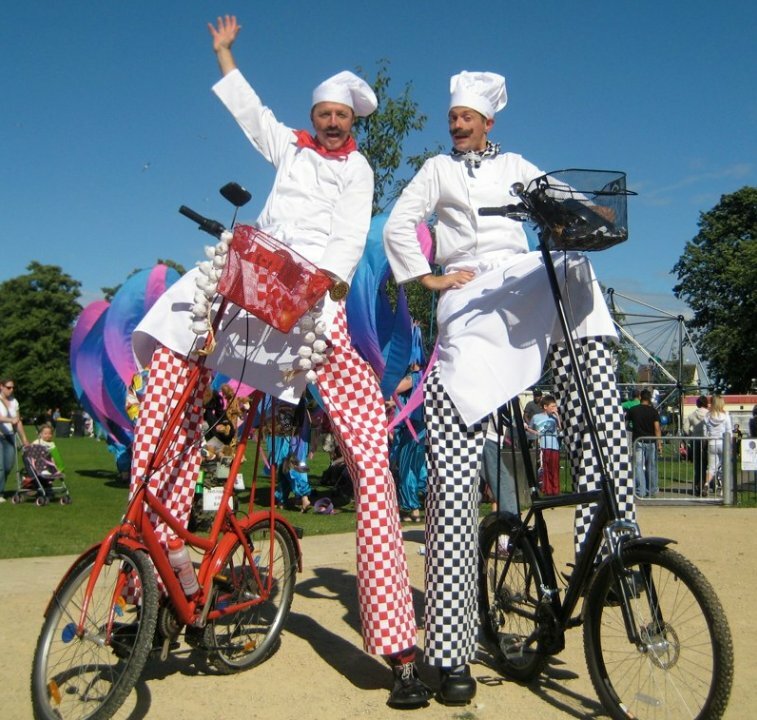 Comedy French chefs Jean and Jean-Pierre juggling food and kitchen paraphenalia on decorated Stilt-bikes. Ideal for French or food themed events. Or French food events! With a ‘Hey Nonny Nonny’, a clash of sticks, a jangling of bells and a fluttering of hankies the ‘Tall Men of Gloucestershire Morris Side’ will be clogging up the streets and gently ribbing our traditional dancers. Great for May events, folk festivals and summer fetes and festivals. Why are some people pirates? They just aaarrrgh! A pair of slightly menacing pirates (well, not that menacing) who bring the adventures of the high seas to any nautical event. The sailors are chirpy chaps with a ships wheel and a loud bugle making sure everything is ship shape and Bristol fashion. 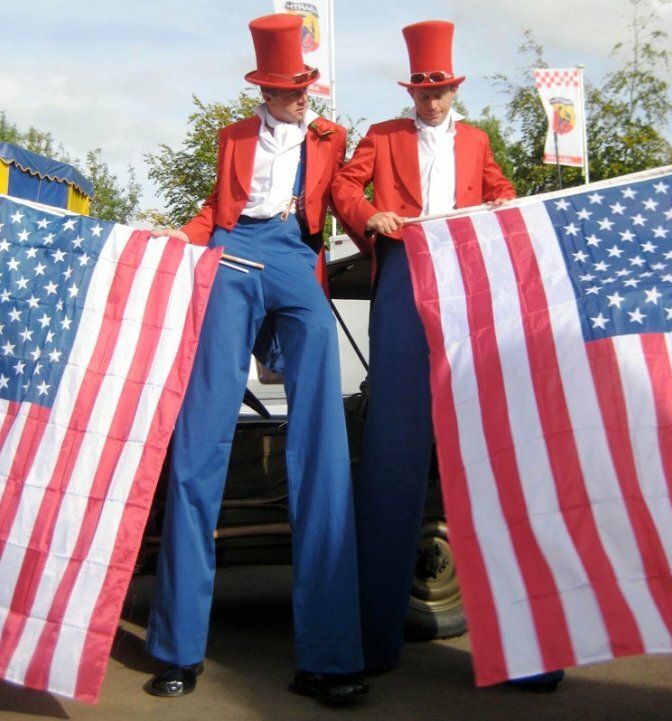 Top two in the American flag these stiltwalking characters bring the spirit of the US of A to any event. They can also pass juggling clubs (decorated with the Stars and Stripes of course!) over the heads of the crowd. 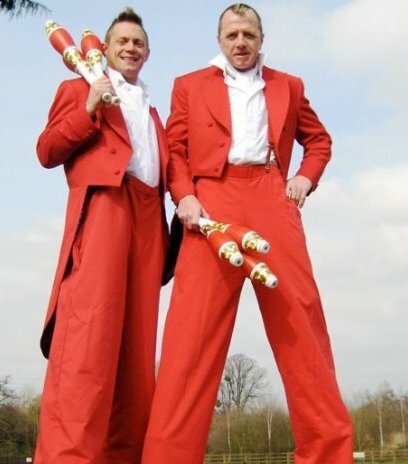 A stiltwalking Ringmaster for meet and greet or to compere an event. Also lots of red costumes on the ground or on stilts. Bringing blessing from on high the Tall Bishop is an unusual addition to the ‘canon’ of characters. Especially created for a summer festival but of course a member of the ‘High Church’! Thanks for all your great work at Blenheim – just what we needed! The way you worked the crowd was amazing so thanks for all your efforts. Fairford’s Christmas Market was the best ever this year and the Chipper Coppers were as brilliant as ever. They seem to get better each year and the children and adults love them. Please pass on our thanks for their great performance. Thank you all so much for Thursday. You were all brilliant. You all worked really hard and you visually looked amazing. Thanks for your time, your patience and your understanding with the moving of dates etc. You were absolutely brilliant. Many thanks again. A big ‘thank you’ to yourself for Saturday… you were a huge hit all round and the store thought you were fantastic… so our client is extremely pleased! I will definitely give you a shout with any future activities! Thanks once more for all your help supplying Maynard’s Chaps. They were brilliant at the event, they interacted well with the crowd, were punctual and professional, helpful in encouraging guests to have a go and all round great fun to work with!! I hope they enjoyed their evening entertaining at the event. We will definitely look forward to working with you again!